Commemorating 1000th birth anniversary of Shri Ramanujacharya and the 126th birth anniversary of Dr. B.R. 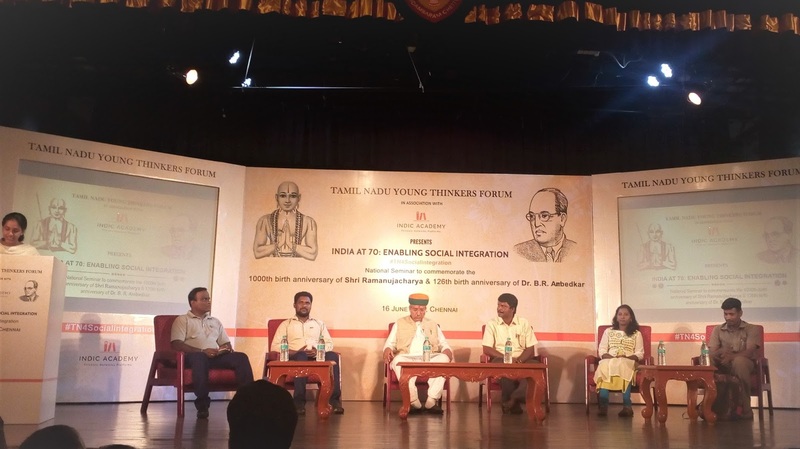 Ambedkar a seminar was organized by Tamilnadu Young Thinkers’ Forum in Chennai on June 16, 2017. 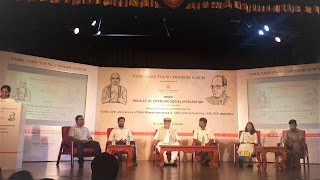 Ramanujacharya-Ambedkar Awards were presented to unsung heroes who have worked for the upliftment of the oppressed class and have done significant achievement in that field. Sri Arjun Ram Meghwal Union Minister of State (Finance and Corporate affairs) presented the awards to the contributors (namely Mr Rajangam, Ms Kalavathi, Sri Annadurai, Sri Thanikaivelan and Sri Saikrishna) to uplift the people from the downtrodden sector. The programme started with a eulogy to the great saint Ramanujacharya and Dr Ambedkar. The Minister spoke in praise of both the great souls drawing parallels between both. The two great people of which one a saint and the other a well learned man of our country had many things in common. They worked for the upliftment of the oppressed classes and were great social reformer. They both spearheaded temple entry, codification of rules and procedures, followed ethics and principles in their life and also worked on water management, he said. A request was made by Mr Rajangam (awardee) to classify the Nomadic tribes as a separate tribe to which the Minister agreed to take note. 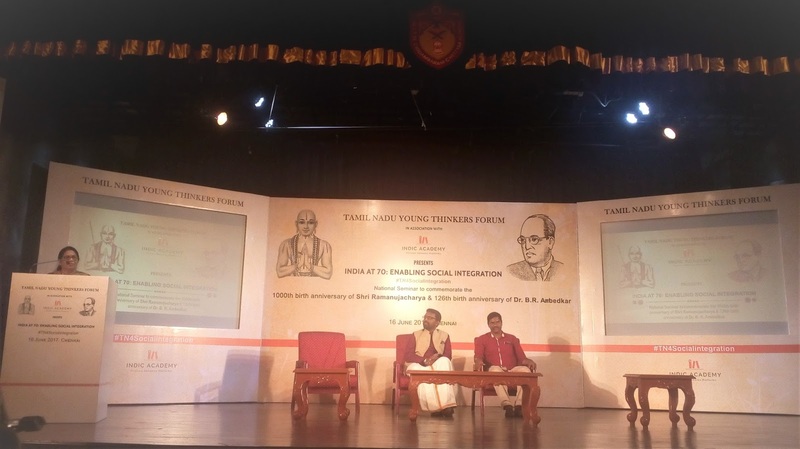 Works of Saint Ramanujaacharya and Dr Ambedkar towards social integration were presented by the following speakers Smt Kesavan, Head of Department, Hindu Civilization, in Eastern University of Sri Lanka, Ma Venkatesan, Madhusudhan Kalaichelvan. · G. Annadurai a.k.a Auto Annadurai: He has made innovation his own by transforming the experience of customers who take a ride in his ‘share auto’. To his credit, Annadurai has addressed employees of Vodafone, Hyundai, Royal Enfield, Danfoss and Gamesa on building customer loyalty. · R. Rajangam: He has dedicated his life to the empowerment of the nomadic tribes in Tamil Nadu. Through sheer hard work and determination, Rajangam has championed the cause of education of the Nomadic tribe, providing employment opportunities for them. He has focussed all his efforts particularly towards the empowerment of women in the nomadic community. · S.K. Thanigaivelan: He has trained over 1000 youngsters from the subaltern community in Chennai to take up sports as a medium of instruction in schools and colleges. His passion is to nurture as many youth as possible, especially from the subaltern community in the field of sports. · Kalavathy Sridharan: A Dalit woman industrialist who has fought all odds to bring forth transformation. Hailing from Kumbakonam, she today runs Shree Apparels in Guduvancherry. Kalavathy’s passion is to inspire more women to enter entrepreneurship, as this is the only way she believes she can give back to the community. · M.N. Sai Krishnan: At 14, M.N. Sai Krishnan drop out of school to support his family. Today, he is giving hundreds of children the gift of education that he himself was denied. Sai Krishnan has trained over 100 youngsters from Chennai slums to appear for the Tamil Nadu Public Service Commission (Group 4) examinations.